As you can see in the test bonnet above, the synthetic white strips did not remove and hold the amount of soil that the cotton yarn did. Ironman not only absorbs significantly more than synthetic yarns, they also produce more friction and actually clean better. With both fibers tufted into one bonnet that cleaned the exact same carpet, the results are undeniable. IronMan bonnets will improve your results over Synthetic bonnets every time. Did you know that micro fiber bonnets are also synthetic? 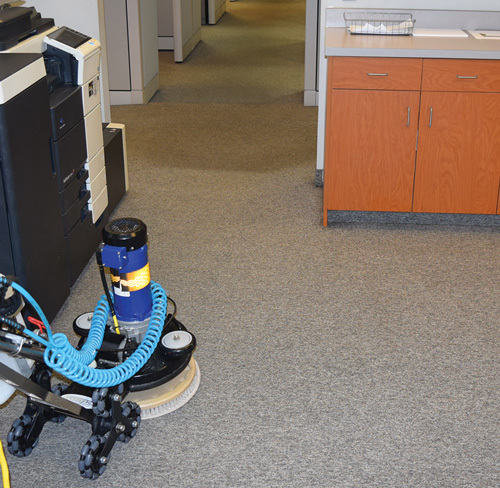 IronMan is your best choice for residential and commercial carpet care. IronMan long-life carpet cleaning bonnets utilize our unique tread-like tufting process called TRD (Total Reach Design). 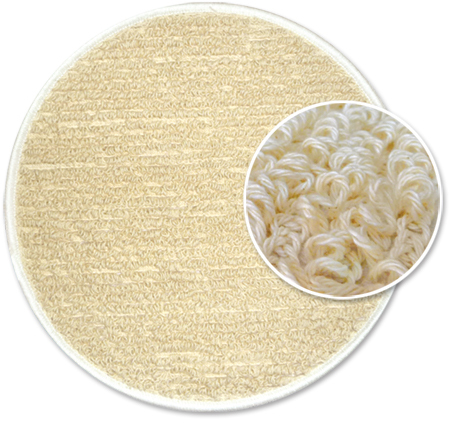 Unlike the small 0.2″ loops in terry cloth type bonnets, our .456″ loops dig in and comb through much deeper and effectively, and provide true two-sided cleaning. Ours won’t bleed through, providing longer run times with fewer pad changes. Now with the use of premium ring spun, long staple, combed, virgin cotton specially made into our IronMan Yarn, you get the best design with the best bonnet yarn available. This gives you an excellent clean, long service life and excellent feel under your rotary or OP machine without the cotton shedding found on other cotton bonnets. And don’t forget, our staggered TRD weave also allows this bonnet to penetrate deeper into the carpet fibers, not just float on the surface, giving you the best cleaning performance. 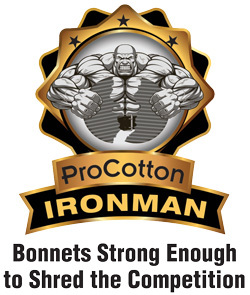 See why the ProCotton IronMan may just be the world’s best carpet cleaning bonnet! Please Note: More aggressive OP machines may require the use of a glide. All Surround, Omega, Revive iT encapsulant detergents are suggested as safe for use with these bonnets. Launder the same day when pads are wet from carpet cleaning with BONNET WASH, laundry bonnet detergent from Bonnet Pro. Use 2 – 4 ounces of BONNET WASH per load. Fill your front load machine to the highest water setting. Select temperature of water and wash on the heavy soil setting. Machine dry when finished. Do not wash with other types of bonnets, especially those with scrubbing strips, as these may cause shedding in the washer. Video shows ProCotton Blend being manufactured. The Ironman bonnet is made the same way but without stripes. Bonnet Pro doesn’t import our carpet bonnets to resell. We use our 30 years of cleaning experience to design and make our bonnets right here in the USA, providing US jobs and a sustainable product flow. Save on Carpet Bonnets & Revive Fiber Pads shipping! Carpet Bonnets and Fiber Pads – Single cases ship for $14.00. 2 or more cases ship for $11.00 each, in the contiguous US only. UPS Ground shipping only. We will happily bundle the additional boxes to save you money. 🙂 If UPS calculated charges come in lower then the above rate scale, we will automatically charge the lower amount and adjust your invoice. Some heavier OP machines and or drives that have had the tips broken in on cement due to manufacturer’s recommendations, may benefit with the use of a glide between the bonnet and carpet. IronMan may not be suitable for all OP machines. Due to the aggressive nature of OP machines and their different orbit sizes, weights and pad drives, some will more quickly wear our bonnets. We suggest washing and drying your bonnets before the first use as this will tighten the loops and help prevent premature wear. Do not over use the bonnet, meaning when it’s dirty, change it, do not continue to run the bonnet grinding in the soils. Make sure the carpet/bonnet is properly lubricated with a good cleaner and enough solution on the carpet to protect the carpet and the bonnet. We have OP users that claim many uses under their OP machine and others that have problems within the first few uses. The pre-wash should help, but Bonnet Pro will not be liable for premature bonnet wear as we cannot control the variables. IronMan runs for dozens of uses under rotary machines without issue, so we have to conclude that some OP machines can create a premature wear issue. This OP user has had a great experience under his OP machine, but some others have not. We are still accumulating data on the reasons why. Hi John. I thought I would let you know that the Iron Man Pads are working great under my 2012 Orbot Sprayborg. I was worried about a dramatic increase in vibration, but after cleaning 21 vacant apartments with frieze style carpet and several thousand sq. ft. of CGD those notions were put to rest. In my experience the increase in vibration is negligible. These pads are as advertised! They clean better and faster than the pads I was using(Glads & Microfiber Striped) Yes, I do notice more “drag”, but that is a good thing. Iron Man Pads are my new pads of choice for both residential and commercial. I must mention that my Orbot is bone stock from the factory as it was built. No modifications in regards to weight or pad driver have been made.